A-midst all these, i m here to do my Yoga, yes blogging is equivalent to Yoga, atleast to me!!!! These ladoos, i made @ Mom's place for Sri Jayanthi. Both appa and amma enjoyed them as they never touch the regular ghee laden or other sweets. Since this was made using millets, uses only half the sugar needed and also is portion-controlled, they had their sweet-tooth satisfied. Dry roast Thinai/foxtail millet and wheat rava separately. Keep aside and let them cool. Grind them separately to a fine powder. Transfer the fine powder to a flat plate. Take sugar and clove together and powder it to fine. Add this powdered sugar to the powdered thina/foxtail millet and wheat rava. Mix them well together. Add roasted nuts to this mixture. Mix well. 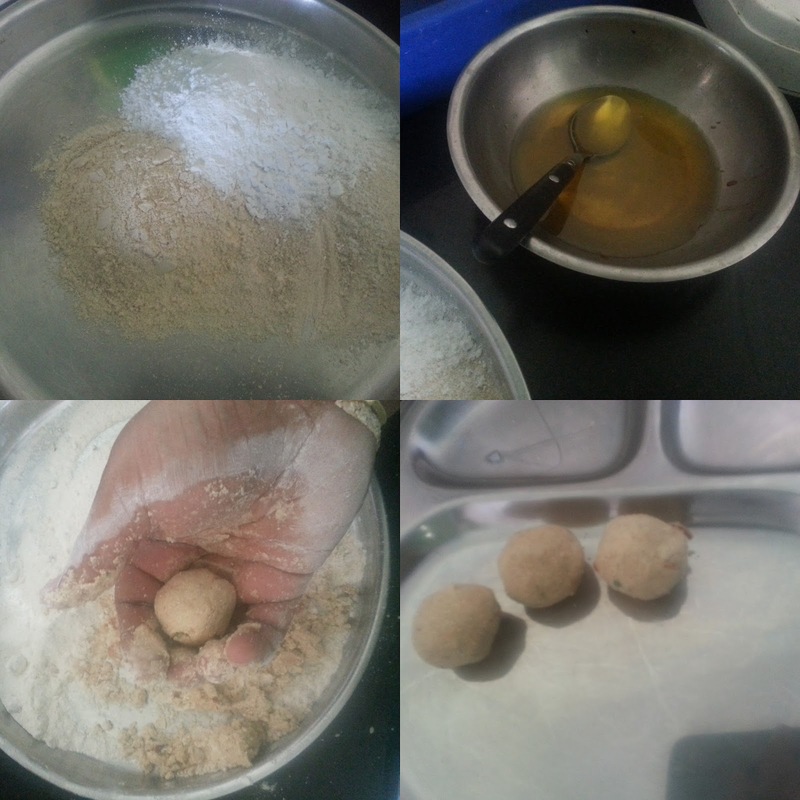 Now to start making the ladoo's, add a tsp or two of ghee to this mixture, grab a fistful of flour mix and start making balls, by shaping it tightly in your fist. Once it holds shape, keep it separtely in a flat plate. Repeat the same with the remaining flour mix. Store in an air-tight container on the kitchen-top. Stays good for a day or two, can be refrigerated for a week. Roasting and Powdering should be done separately for the millet and sooji. if you do not want to use ghee for making the ladoo's, you can use milk. But the shelf life would be very less and must definitely be refrigerated. you can even roll the ladoo'si in dessicated coconut of more nuts for an extra oomph and richness. Makes a good gift on a festive day. Very interesting and beautiful combo, very healthy laddoos.